A Circular Prime is a prime number that remains prime under cyclic shifts of its digits. When the leftmost digit is removed and replaced at the end of the remaining string of digits, the generated number is still prime. The process is repeated until the original number is reached again. A number is said to be prime if it has only two factors 1 and itself. 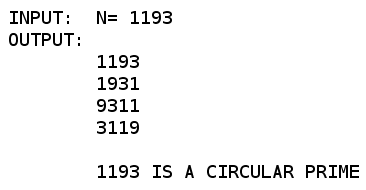 Hence, 131 is a circular prime. Note: A circular prime with at least two digits can only consist of combinations of the digits 1, 3, 7 or 9, because having 0, 2, 4, 6 or 8 as the last digit makes the number divisible by 2, and having 0 or 5 as the last digit makes it divisible by 5. Please note that in the above solution the number N is an integer and all operations are performed which is computationally better (efficient) than converting between string and integer for circulating the number. The function isPrime also uses a number of optimization for efficiently determining if the number is a prime number or not. For details of the isPrime() function refer to my earlier post on primality i.e. Prime time. This entry was posted in Code & Logic and tagged ISC 2016 on February 18, 2016 by Vinay Singh. Try the number 70 for the circular prime program. Thank you for pointing out the mistake. I have modified the program to remove the anomaly.